Nursing began as a way to provide hygiene and comfort to sick and disabled people, and in 380 A.D. the first hospital was established. As the medical profession continued to advance, nurses were instrumental in caring for patients and helping them feel comfortable. Eventually, nursing was recognized as its own field. Below are five pivotal moments in the history of the nursing profession. Florence Nightingale is considered the creator of modern nursing. Because of social norms, most women in Nightingale’s day grew up to become wives and mothers. Nightingale rejected those customs, however, studying nursing despite the disapproval from her family. She is perhaps most famous for her work caring for soldiers during the Crimean War. During that time, she was instrumental in decreasing the death rate through her focus on hygiene. In 1860, Nightingale funded and established the Nightingale Training School, which is now associated with King’s College London. She played a crucial role in introducing trained nurses to the world. The American Nurses Association actually began in 1896 as the Nurses Associated Alumnae, which primarily worked to improve nursing care for soldiers. At that time, no licensing regulations existed in the nursing field, however. After North Carolina became the first state to pass a law that helped standardize the field of nursing in 1903, other states began to follow suit. The Nurses Associated Alumnae changed its name to the American Nurses Association in 1911 and now represents registered nurses throughout the country. Its mission is to create touchstones for the nursing industry and improve the working environment for registered nurses. The first independent nursing school in the United States, Yale Nursing School accepted women into its program. This was an uncommon practice in colleges and universities of that day. 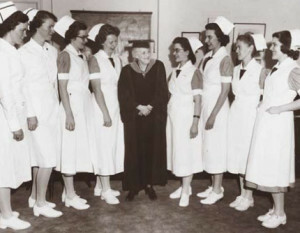 Yale’s Bachelor of Science in Nursing degree program was established in 1925. Before attending the program, students had to gain a general college education elsewhere. That requirement changed in 1934, when students were required to earn a bachelor’s degree at another college or university before applying for Yale Nursing School. Florence Wald was interested in nursing after spending a great deal of time in a hospital as a child because of a respiratory illness. She worked as a nurse, professor and researcher throughout her career. In the 1960s, Wald started to become interested in the care of terminally ill patients. She believed that at that point in their lives, those individuals should focus on connecting with loved ones instead of going through treatment after treatment for an incurable disease. In 1974, Wald launched a hospice program that provided in-home care for people with life-threatening diseases. Eddie Bernice Johnson did not begin her career expecting to go into politics. Johnson first earned a bachelor’s degree in nursing and then went on to obtain a Master of Public Administration. She was the first African American to work as Chief Psychiatric Nurse in the Dallas Veterans Administration Hospital, where she served for 16 years. Johnson was elected to the Texas House of Representatives in 1972 and to the U.S. House of Representatives in 1992. Once nursing education began to develop, the nursing profession grew rapidly. According to the U.S. Bureau of Labor Statistics, job opportunities for registered nurses are expected to increase by 16 percent until 2014. Registered nurses manage patient care and provide emotional guidance and support to patients and their loved ones.